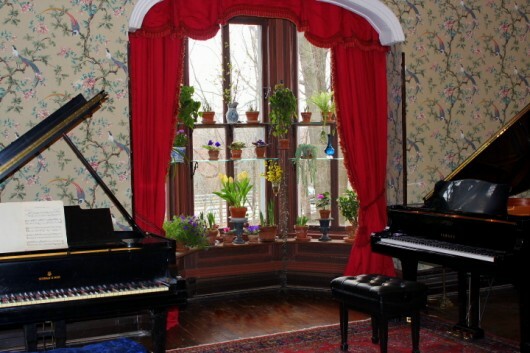 I think the reason that plants do so well in the music room is because they are regularly treated to fine music. The ferns are especially fond of Bach’s Preludes and Fugues, as well as the piano sonatas of Beethoven and Mozart. 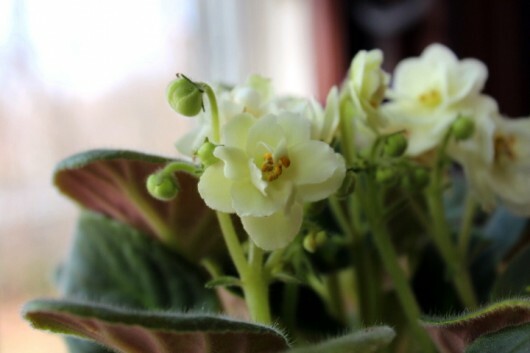 However, the African violets sometimes cry out for Adele. Or Carole King. Or Lady Gaga. Or Rufus Wainwright. 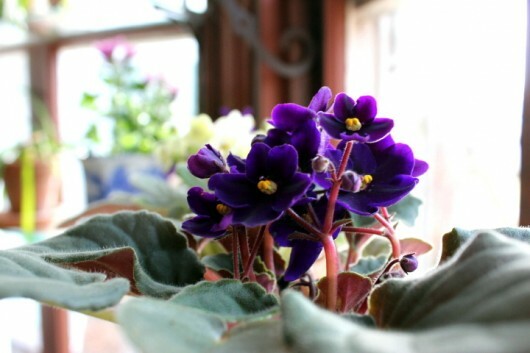 Obviously, African violets have excellent taste. 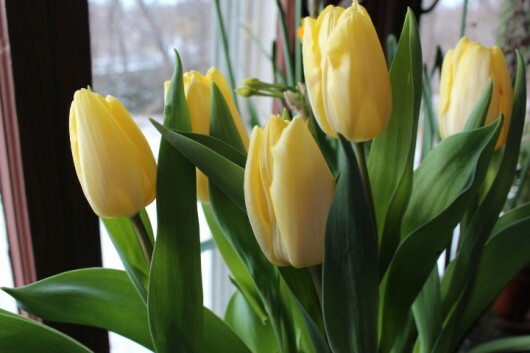 Taking center stage on the window sill is a pot of home-forced Tulipa ‘Sunny Prince.’ Are you familiar with this early-single variety? 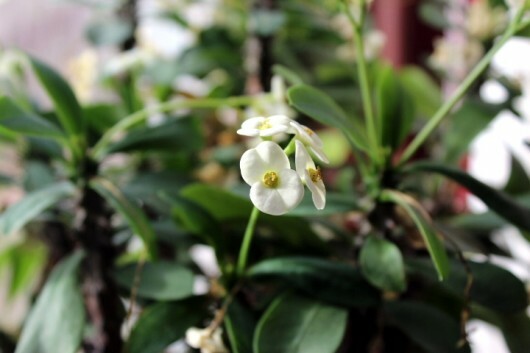 The flowers are lemon-yellow, and get this — they are fragrant! The scent is sweet, citrussy, and infinitely inhalable. The flowers are born on sturdy, 12-inch-tall stalks. If you need a great tulip for your garden, or one to force for indoor bloom, by all means acquire this variety. The perfume alone will send you over the moon. 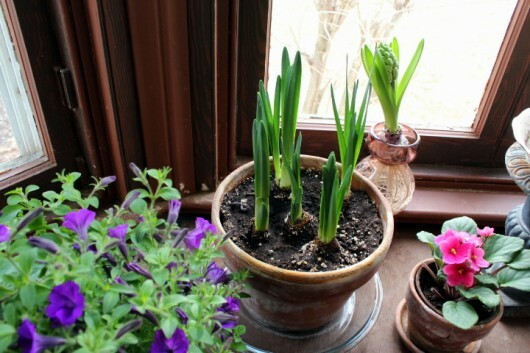 There are several other home-forced bulbs in the window, although they haven’t bloomed yet. Above is Narcissus ‘Erlicheer’, my favorite of the scented Narcissus clan. In the background are vased ‘Blue Jacket’ hyacinths. In response to the lengthening days, this lavender-blue Pelargonium is budding regularly now. I reward it with a low-nitrogen, high-phosphorous food. 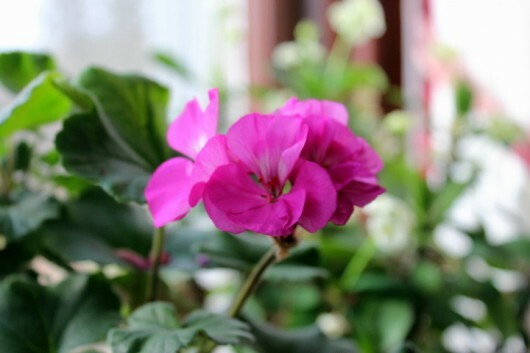 And by the way, if you are overwintering your pelargoniums, now is the ideal time is take cuttings from the plants. These by May will achieve flowering size. My “Crown of Thorns”, or Euphorbia milii, is never out of bloom. I give it full sun, a clay pot, and water only when the top inch of soil feels dry. I took 3 cuttings from my petunia late last summer, and rooted them a 6 inch pot. My how they’ve grown! I have to clip them every two weeks to keep them “house size.” But I love the purple flowers that offer a sweet breath scent of summer. And what, you might wonder, is in the little bell-shaped hanging vase? Why, it’s little forsythia stems, clipped from the dormant shrub that lives in my front yard. The “dead” twigs take only 2 weeks to bloom in the warmth and light of a window. Forsythia forcing directions and display ideas. And this fully-double, greenish-white one. 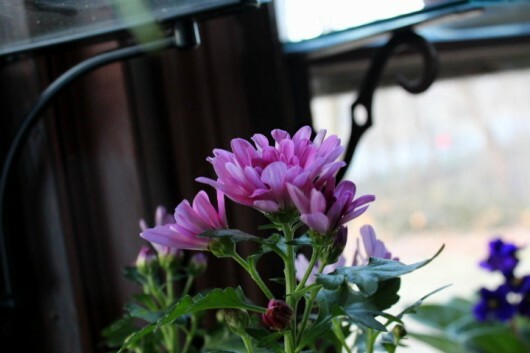 Also on a glass shelf is a pinkish-purple chrysthanemum, which I obtained from the florist. As temporary decoration, I think chrysanthemums are great investments. Keep them cool, water them daily, and they will bloom and bloom for weeks. Flowers aren’t the only subjects in the window — there are green things, too. 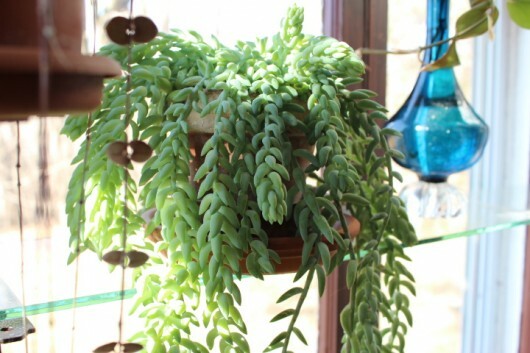 Above is the graceful Sedum morganianum, which you might know as “Burro’s Tail.” It requires no attention whatsoever, besides once-a-month watering. In the blue vase next to the sedum are cuttings of philodendron. And speaking of philodendron, these easy creatures observe the world from a pair old kerosene lamp brackets attached to the window frame. This Boston fern is the result of my division efforts last fall. From one giant fern I achieved 8 small ones. These babies fit nicely on the shelves of a window garden, and they do not develop brown, unsightly fronds like their grown-up colleagues do. 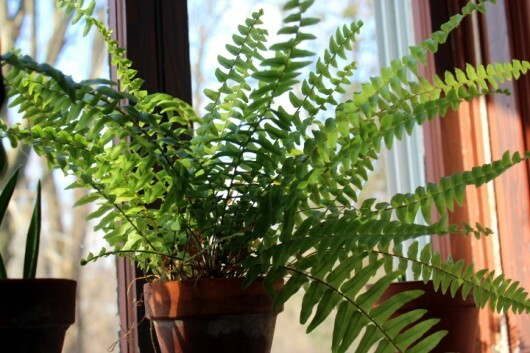 How to divide the Boston fern. I hope you enjoyed this little meet-and-greet. Now, tell me what’s growing in your own window garden. You know how much I love to hear from you. Spectacular! Just lovely. Kevin, is that a little petunia in the lower left corner? Specifics on it? You do have an amazing eye. I never would have imagined such an eclectic group could be so overwhelmingly beautiful. The sum of the parts being greater? Good job and thanks so much for sharing. Beautiful. 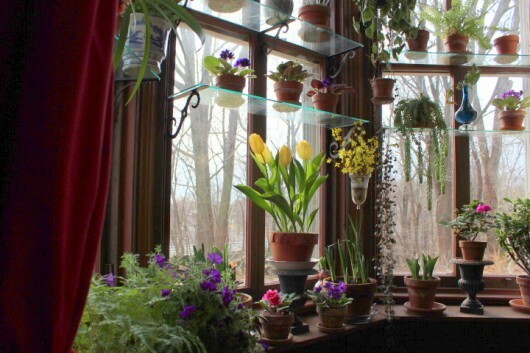 As an avid indoor gardener, these are my favorite posts on your blog, and I look forward to seeing your beautiful windows light up with plant color. After taking your advice on African violet care, I am proud to say that I have some success finally getting a few of them to bloom for me. I’m still working on getting my ‘Crown of Thorns’ to bloom, though – I’ll keep you posted! I also purchased several tulip varieties which are growing indoors at my home after getting inspiration for this idea from your blog. Thanks for the beautiful pictures and inspiration! 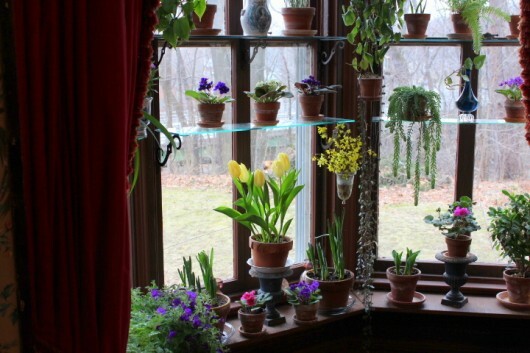 Thsnks, Kevin, for that beautiful tour of your Music Room window garden–just lovely! In my kitchen window, I have an amaryllis that a friend gave me. I’ve never seen one in a vase, rooted with stones in water, but it’s blooming wonderfully. I also have a vase containing clippings from a summer basil plant. Did you know that they’ll form roots and look fresh as cut flowers (I didn’t until a friend showed me)? In that vase are also clippings of rosemary which form roots as well. 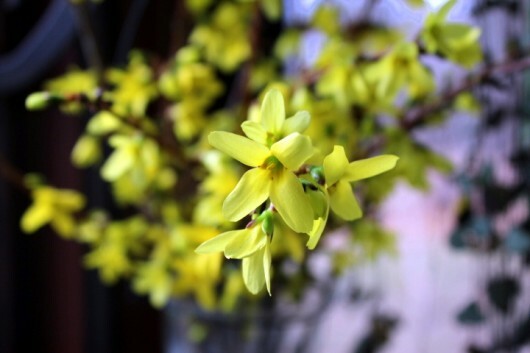 And finally, in my dining room, I have a lovely arrangement from another friend, the hightlight of which is forced forsythia! It lets me never forget the promise of spring, even though the days may be snowy, dark, and cold! Kevin, your info on African violets is just what I need right now. I thought they needed to be in plastic or glazed clay pots.(?) I can’t remember if I read or experienced(long ago) that violet leaves that touch the top of a clay pot will die. Is this a fact? Do you simply make sure the leaves don’t touch the pot? I am extremely proud to tell you I have 4:00’s (Mirabilis) blooming right now under my grow lights. Never happened before! The pot held new seedlings in late summer, outside, and was accidentally forgotten and frosted in October. All top growth was killed, but the young, dark carrot-like tubers were not affected. I brought the pot inside to rescue it and really forgot about it. New top growth emerged which got my attention immediately and I moved it closer to the lights. The pot is very thirsty, a direct correlation to the expanding tubers and the vigorous top growth. Buds appeared in mid-January, to my immense delight, and now the fragrant, fuchsia-toned trumpets are opening daily. It’s just wonderful. I also have two pots of 8-month-old rooted cuttings of Hibiscus rosa-sinensis blooming on and off since December. They are very picky about their position with regards to the light source and may drop buds if disturbed while attempting to bloom. I am honoring the memory of my parents’ Polish immigrant neighbor through this shared plant, a man who always gardened next door to where I grew up, serving as a fine role model. He gave me cuttings years ago and made me promise to water this brilliant red “Chinese Rose” only with rainwater. The huge mother plant provides new cuttings regularly for sharing with gardening friends. There is the Persian Shield (Strobilanthes), grown from fall cuttings , trying to bloom, but not being allowed to, in favor of foliage development. Lastly, my Kentia Palm is blooming in the dining room with four spidery stalks smothered in tiny yellow balls. It performs each winter this way, its tropical foliage a striking bright green against the terra cotta colored walls. Your photos are so inviting and cheerful !! Love the sight of those tulips. Love,love,love the wallpaper in the music room! Lovely window garden. I currently have blooming: a lovely apple-blossom amaryllis, a large, glossy leaved pink African violet, two orchids, and a container of paperwhites. I, too, love indoor blossoms in the wintertime. I also love the wallpaper! What beautiful plants too. My Mom gave me some African violets two years ago. I’m surprised I haven’t killed ’em yet. I usually don’t do house plants. My question is the largest ones roots seems to be above ground now. Should I be concerned? All three plants are in the same elongated plastic flower holder. I have around 35 heirloom tomato plants sprouted (several varieties), a few red and yellow peppers, swiss chard and exactly one pea plant (old seeds) that will have to be transplanted soon. Yes, I admire your wallpaper wistfully, as I am up on scaffolding removing 2 layers of awful paper way up high in the stairway of our mid-century home. I have a Christmas cactus which is feebly and lately blooming. We moved last spring and it hasn’t found it’s groove yet. In years past, it bloomed profusely every Advent. My amaryllis, which was bent at a right angle, has straightened up presenting a new bud! Thanks for the lovely photos of your beauties and the music recommendations, too. About 40 African violets keep me busy and keep Spring here every day. What a wonderful little plant!! Homygosh that display is fantastic… No, correct me – that WINDOW is fantastic! You know, I impulse-purchased an light orange Kalanchoe to grow in my sunny 2nd floor computer room that has a southern-facing window? I have some glass shelves that I think will fit in the window frame – all I got to do now is go get some brackets for them! I was also going to comment on the lovely wallpaper. Fitting songbirds for a music room. As usual, done with refined class. Very nice. Thanks for sharing. Oh, glorious, Kevin. 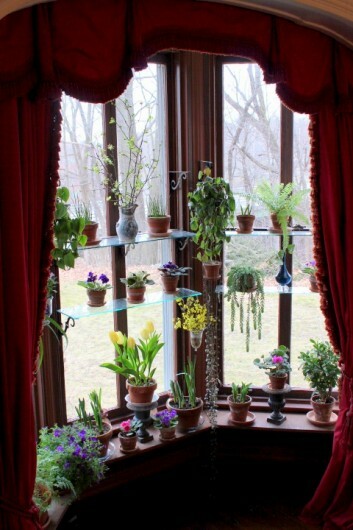 I SO want a window garden, but I think my window is too wide. The span is a little over 40 inches– is that too long for brackets and glass? What think you? Meanwhile, on tables in front of the east window I have a begonia purchased last spring from Trader Joe’s still blooming, some primroses, a Christmas cactus resurrected from a friend’s neglect and one of those pretty little lacy white and green ferns they sell at Christmas. I keep a vase of alstroemeria there all the time to give more color and height. color. In my rather dry and warm living room ( wood stove) I have a variety of cactus and succulents on a ledge under the window. Jules – So glad you are feeling better! Sounds like you have a couple of nifty projects in the works, first winter-sowing and then preparation for raised beds. Kudos to you. Last year I wrote an article called “Creating a Raised Bed Garden” that you might find helpful. Let me know how your projects progress, okay? What a lovely window garden, Kevin! I’m surprised, though, that it’s not too chilly for the AF’s. I also wonder about growing them in plastic pots. I know you use all clay ones; do you not find that they dry out more quickly than in plastic? I am sometimes somewhat neglectful of checking the moisture in mine, so I reason that the plastic sort of “protects” them from my lack of consistency in watering. ( I know, my bad.) Anyway, I would switch to clay if you think it’s better for the plants. A Garden for the House is a weekly gift. Thank you! I enjoy every word. Each week is full of wonderful surprises, great tips, fabulous variety of delicious recipes, tours inside and out and all with a terrific sense of humor and great photos of everything. All of you and the gardens stay safe in the storm. Woof to Lily. for one of my kitchenwindows basil and onions are growing. In the living room the sill of the southwindow is filled with a vase with blooming branches ( no idea what kind of shrub, bought them december 13th, they were sold to spray glitter on them, but when I discovered they were still alive I put them in water and in january they started to blomm with round balls with tiny white flowers an dnow they have nice green leaves), a papyrus, a thnaksgiving-cactus ( that had 150 flowers past year), 3 small moss-gardens ( in spice-jars), 3 baby- orchids ( about 1 yr old now) and the latest addition: a green stalk growing out a part of ginger-root I planted between christmas and the new year. I had to remove the cloche today because the stalk has outgrown the cloche. At the morth windowsill are an Anthurium and about 10 orchids, different kinds, some blooming, some in rest. I love to be busy with gardening and indoor flowers. the amarylis. Backdrop is a lovely lace panel curtain with sunlight streaming through!!! I have many Philodendron plants all grown from cuttings from one lil Philodendron plant I bought in Lowes for about $2.49, several yrs. ago. I have to prune the plants again. 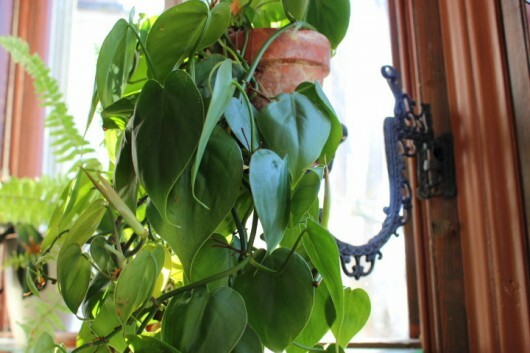 How often do you give your Philodendron plants a haircut? Are you “ruthless” in pruning them? I try and share the cuttings with other people I hate to just throw them out. What do you do with the cuttings? I have a lot to prune on them again and just how many additional plants can I have?!!?!? What do you do with your cuttings – share plants with others or what? Thanks! I LOVE YOUR FORCED FLOWERS!!! 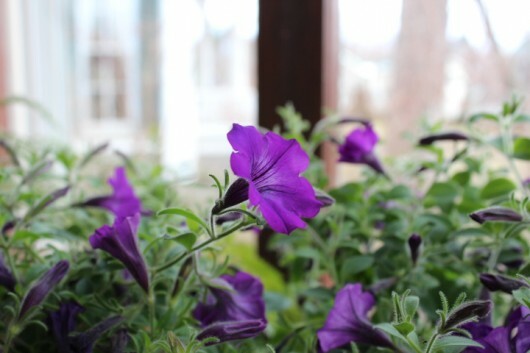 I love Petunias and am planting them right now. I have seedlings about a month old. I didn’t know they would actually flower indoors like yours did!!! WOW-Wee, I love your window displays – beautiful!! Marissa – Yes, philodendron is very generous plant. I cut mine back to about 8 inches of dangling growth just before taking them outdoors for summer vacation. There, they lounge and luxuriate — and grow! As for cuttings, some I keep, others I toss in the compost bin. One must ruthless every now and then. Kevin, do comments disappear? I could swear I saw mine last night, but it has since gone away….maybe I’m going crazy! My questions concern begonias. I bought one at Trader Joe’s yesterday that the label really helpfully says is an indoor/outdoor begonia. I already have one like it which has bloomed throughout the winter beautifully. I have looked up begonias and seen photos of this type, but they are not named. I think this one is not a sempiflorens. May I email you a photograph? The other question is, that now that I have another one of the same type, should I cut back the blooming one to give it a rest? I haven’t wanted to do that for fear that it will stop blooming!! Hi Susi – By all means send me a picture. The address: kevin(at)agardenforthehouse.com (use the symbol @ for “at”). I’ll try to identify the begonia for you. Kevin, I’ve been reading about the Solenia begonia. It’s a cross between the wax begonia and the tuberous. No dormant period needed,and it does well indoors, they say, as well as bright sun. Loads of good colors– have you tried any? Sounds like a great plant for winter color. I’m going to Logee’s in late Feb. and they have at least one color. 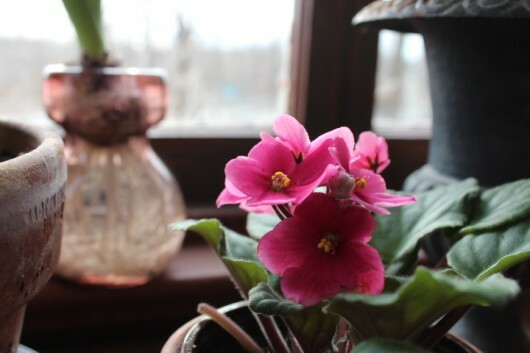 Hi Susi – I have not yet tried the Solenia begonia, but will order a plant soon. And by the way — if you’ve never visited Logee’s before, get ready for a big surprise. In winter it resembles the Garden of Eden! Kevin- I have been there several times, but not in a long while.It’s less than an hour from me. It truly is a Garden of Eden. I’m hoping they carry even more in the greenhouse than listed in their catalog.. Like more colors of the solenia. Will you order your solenia from them or somewhere else? So sorry I can’t drop one off for you! Susi – In my experience, the best thing about shopping at Logee’s in person is that you can get bigger versions of the plants they list in their catalog. Otherwise, in order to reduce shipping costs for the customer, they usually ship small (meaning young) specimens. And you are lucky to have Logee’s so close to you — for me, Danielson, CT is a 2 1/2 hour drive. I will certainly order my Solenia begonia from them. No wonder my Burro’s Tail died, I would water it once a week along with everything else!! I have a gorgeous hanging Hoya Carnosa, but it has quit blooming! Do you know anything about them? I thought maybe about re-potting it, but it has looped around the hanger so many times, I don’t know if I could or not. And I give it Miracle Grow occasionally. Any ideas? Love your window garden, and your descriptions and tips. 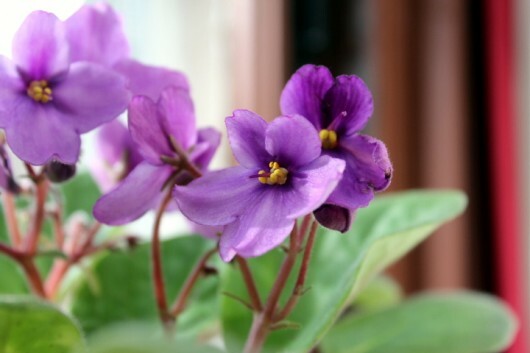 I have several African Violets, one of which has grown quite large and has two blooming “sections” with a third coming up… will follow your instructions to divide and repot. I have 8 or 9 plants on my dresser top, sitting by an East/slightly Southeast window. These include an orchid, a pink and green philodendron, a Silverleaf begonia, a Persian shield and an Episcia. They all seem to happily live together. In my living room I have a 6 foot tall Sanseveria, a large trailing variegated philodendron, a lime green pothos, several ferns of various sizes, and a variegated pointsettia still in bloom since Thanksgiving (!) My apartment has lots of windows and as I am on the third floor, I am “in” the trees and get lots of light as the trees are not too dense. Hi Kevin, I just finished looking at your house and garden tour! Wow!! You are lucky to have found this gorgeous old house and were able to do all of the restoration to it that you did. I feel like my little 3 bdrm starter house is so bland, but i have many ideas, some from you, for out next home. Currently on my kitchen window sill i have an Amaryllis, it had 2 flower stalks with 4 blooms each! In the past, i am lucky to get only one or two flowers on one stalk. It has finished flowering and the leaves are growing nicely. Next to it is a shamrock plant that has been in bloom for the past 8 months, it loves the cooler kitchen window, but will die back and need to moved once summer heat hits. And a revived Mother-in-Law’s Tongue / Snake plant. It was given to me years ago, and had sat neglected in computer room. I have finally gotten the time save it, rooted the best pieces and now they are happily growing in dirt. Usually i grown some herbs in the kitchen window, but not this year, no room. Maybe i can get hubby to add a shelf part way up, but then i will need a longer spout watering can or a step stool to reach. Spring is here, and maybe soon the snow will be gone and will warm up. The garden beds looks so abandoned and desolate, they are in need of digging up and being planted soon. Hey Kevin! Have enjoyed your blog for probably 2 yrs now. Have recently moved into our new home and ventured into a purchase of paper whites and amaryllis lilies. Paper whites came up very quickly and bloomed over Christmas (and I love the smell!). Now I have spent blooms and lots of tall, tall leaves. What do I do now? Can the bulbs be preserved for the next ‘season’??? Help!!!!! your plants are Great, no that is not a good enough word, beautiful is better, I only have 13 African violets in front of the on a table, but i have other green plants all over the house and flowers in pots on the front deck , lots of wild flowers out in the field, cause the eat lots of plants here, but I really enjoy them all, we have hummers here on the porch also, even the fuzzy kids like the birds. not cats an Aussie and a Shellty………………………..